Before dig into compound triggers let’s write about trigger timing first. Compound trigger can do all previous ti mining in only one compound trigger. a- Compound triggers combine all triggers timing in one trigger body. b- Compound triggers is only for DML operations and it doesn’t support DDL and system operation. e- You use WHEN clause to improve the performance of triggers. but no support of WHEN clause in compound triggers. f- There is one declaration section for all trigger timing which can share variables until finish transaction. g- Duplicate of trigger timing are permitted in compound trigger. Note that BEFORE STATEMENT, AFTER STATEMENT, BEFORE EACH ROW and AFTER EACH ROW are optional selection, so you can use what you want regarding your requirements. 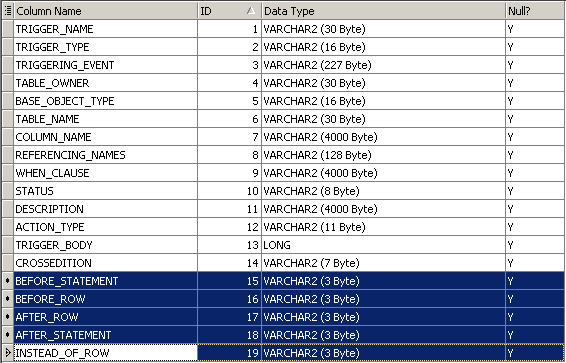 INSTEAD OF ROW is used with database views only.